Although many 8th-graders can appreciate the blood-and-guts movie/video game aspect of the Civil War, teaching them about the strategy and battles of the war can be a difficult challenge. For the Blueprint Civil War unit, we took two approaches: a lesson on the strategy and crucial battles, and another lesson on the effects of the war. This blog is devoted to the Strategy and Battles lesson. The historical focus question for the lesson is “Why did the North win?” At the end of the lesson, students will make their own interpretation to answer this question. First, the teacher introduces the focus question, stressing that there is no single answer to this question and that they will need to consider a number of factors in making their interpretation, including military leadership and strategy, resources, battlefield geography, and the sacrifices of soldiers and civilians on both sides of the dispute. Then the students read a secondary text on the advantages and disadvantages of the Union and the Confederacy, and take notes with the help of a comparison-and-contrast passage organization chart. 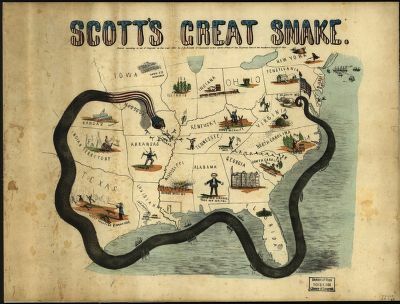 Then students will analyze a visual representation, “Scott’s Great Snake,” of the Union strategy. To explain how teachers might use the visual, here is a section from the lesson plan. If you would like to see the lesson handouts, click on the names. Project and distribute The Primary Source Toolbox: Scott’s Great Snake CW6.2 Scotts Great Snake. In pairs or groups of three, have students examine the document on their own following the questions provided and then ask for volunteers or select students to share their answers with the class. Finally, ask each group to speculate as to the advantages and disadvantages of this strategy. Answers may vary, but students will hopefully guess that this map shows Union general Winfield Scott hoped to encircle the Confederacy in order to win the war. Explain to students that this map is meant to represent the Anaconda Plan, in which the Union hoped to surround, or choke, the South by 1) blockading southern ports, which would limit trade and thus income for the Confederacy, and 2), driving its forces south along the Mississippi River, splitting the Confederacy in two. This two-pronged approach was called the Anaconda Plan, because, as its supporters argued, it would squeeze the south like a snake encircles its prey. Distribute The Confederate Strategy: Offensive-Defensive CW6.3 Confederate Strategy. Tell students that now we have a sense of the Union strategy at the beginning of the war, we need to understand the military plans of the South. Read the short excerpt from James McPherson’s Battle Cry of Freedom aloud, highlighting the phrase “offensive-defensive.” Next, have students reread the excerpt on their own (or in pairs). Finally, have students deconstruct the definition by answering the questions that follow. Circulate around the room to make sure students understand the text and can complete the assignment. Ask each group to speculate about the advantages and disadvantages of this strategy. The strategy did provide initial advantages to the Confederacy because defense requires fewer resources because the troops did not have to travel. The troops were also dedicated to the fight to protect their communities. However, in the long run this strategy led to the decimation of southern territory, and sometimes the Confederate army wasn’t able to take advantage of Union weaknesses. Finally, have students draw their own political cartoons to represent the offensive-defensive strategy and have them share these cartoons with their neighbors. Making an Interpretation: Which strategy would be most effective? Using their notes from CW6.2 and 6.3, ask students to discuss the following: Compare the military strategies employed by both the north and the south at the beginning of the Civil War. What strategy will be the most effective? Why? Answers will vary, but should include evidence gleaned from CW6.2 and CW6.3 to support their argument. A study of individual battles follows, but that’s for another blog!